Now that Apple has announced the smaller 4-in. iPhone SE starting at $399 (16GB), smartphone competitors like Samsung are sure to sit up and take notice. It makes sense that Samsung will respond in kind, since it has launched just about every conceivable style and size of Android phone. That approach has helped make Samsung the biggest smartphone maker globally. Samsung claims to have invented the "phablet" phone, referring to devices with displays larger than 5.5 inches in size. 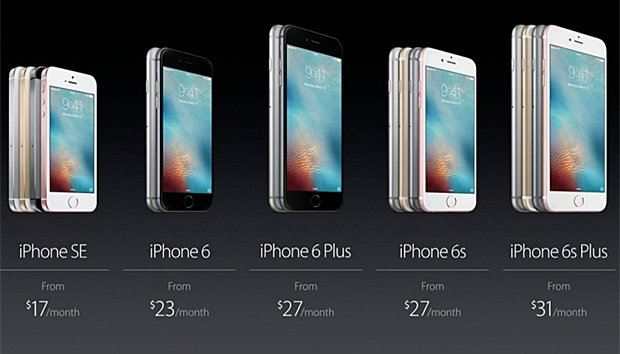 Apple first entered that larger phone space with the iPhone 6 Plus, and its 5.5-in. display, which debuted in September 2014. But now Apple has gone back to the future with its 4-in. SE device. Samsung in August 2014 introduced the 4.7-in. Galaxy Alpha, which didn't sell well. The reasons are complicated, but timing was a big factor. Taking Samsung's history with the Galaxy Alpha into account, there might be lessons for Apple as it launches its new 4-in. SE handset running iOS 9.3. There will surely be lessons for Samsung as well. "The Alpha didn't sell well for a variety of reasons that go beyond its smaller size. It was a time when people were looking for larger screens," said Kevin Burden, an analyst at 451 Research. "It shows how important timing is in smartphone sales. Just because Apple is going with a smaller phone now doesn't mean it will fare any better than Samsung did a couple of years ago," Burden added. "User preference can change drastically in a short amount of time. However, it is possible that users are starting to feel a bit nostalgic about iPhone size." At its Monday event, Apple took up the theme that some people love smaller phones. The company noted that it had sold 30 million previous iPhone models with 4-in. displays in 2015. Many of those buyers were new to the iPhone, either coming from an Android device, or buying their first smartphone. In China, the majority of new smartphone customers or those coming from an Android device, picked a 4-in. iPhone model, Apple said. A slide from Apple of a pie chart indicated about two-thirds of the buyers in China favored the 4-in.-size phone. The March announcement for Apple will also help sales, taking away pressure from Apple's typical release cycle that puts phones on the market for fall and holiday sales, Burden said. More than its 4-in. size, Apple could benefit from the $399 pricetag for the 16GB version and the $499 64GB price. Samsung's Galaxy Alpha was considered overpriced when it sold for about $450 in 2014, Burden said, even though it had 32GB of storage and came with a 4G LTE radio and a 12-megapixel camera, the same size as the iPhone SE camera. Burden attributed the Alpha's slow sales to bad timing — when people were moving to larger phones — but also to its high price tag. "It was a high-end phone with high-end body materials, but without the complete technical high-end, and still with a high price tag," Burden said. "It was also quickly replaced in the Samsung lineup with the A5, which went back to more plastics and less metal." Where Apple may succeed, and where Samsung has not, is that Apple customers can have their choice in sizes of high-end phones, ranging from 4 inches to 5.5 inches, "without sacrificing functionality," Burden said. Samsung could well come back in coming months, perhaps as early as the fall, with a Galaxy S7 phone with a 4-in. to 4.5-in. screen that is also water resistant. Those offerings would create a fuller line of phones when put in a lineup with the new Galaxy S7 (5.1 inches) and the S7 Edge (5.5 inches) phones. Samsung didn't comment on the new iPhone SE, but analysts said they wouldn't be surprised if Samsung builds a high-quality Galaxy S-type smartphone in a 4-in. or somewhat larger size. "Sure, I can see Samsung doing that," said Bob O'Donnell, an analyst at Technalysis Research. "I think there is a segment of people who prefer that size. The trick today is to fill all the different niches."